Being a collector of the Hey Wake blondes, I have a whole house full of them! Those of you who collect know when you find pieces on the secondary market, they are usually in less than stellar condition and come with a slew of finish issues and damage. I started refinishing pieces for myself. My very first piece I just restored the top of and had my friend and finisher at my job help with matching the finish to the aged original. It went well, but I knew I could not continue to rely on my friends at work. So I decided to move forward using the werefinish.com 2 step water based system to match the original stain. I love working with it. Here are some pieces I have done with it and there are many more yet to do in my house! Completed cabinet is now in my living room holding my TV! Refinished the top only of this piece. My stain system was a perfect match! It was sold and moved to California! I had 8 dogbones and really only wanted 6. My customer wanted to buy 2 to add to their other 4. 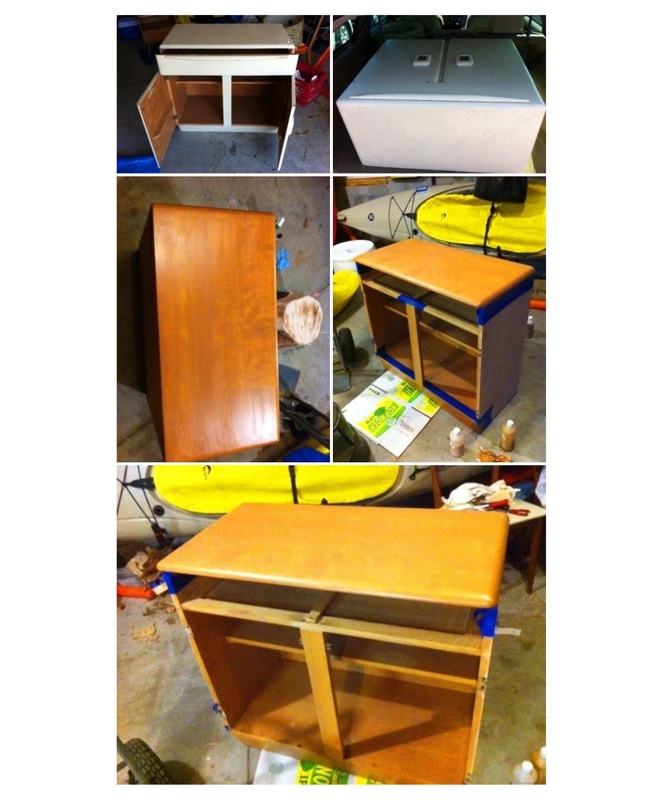 They hired me to do the restore work so I took these 2 from trash to awesome! You can see them in their final home on the WALL OF FAME page! They matched their new friends perfectly! My only dogbone arm chair before.....yuck. After! I picked this fabric as 4 of mine have original dark green vinyl in mint condition, so wanted to coordinate the other 2. I still have 5 more of my own chairs to restore when I get around to it. We are using them in the mean time. Full restore due to bad turquoise paint job followed by 'natural' restore in not original color. They are now back to champagne and are super cute. Stay tuned for more fabulous Hey Wake restores! As a collector, I am always adding pieces to my personal collection and sometimes I will look to sell off a piece to make room for something else. If you are a Hey Wake fan, please keep an eye on my shop! 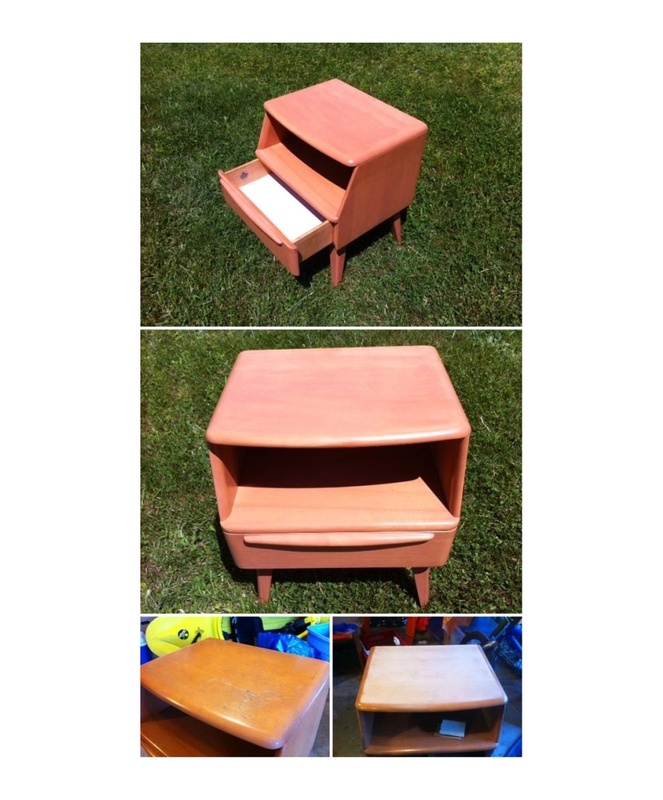 I just picked up a step end table to restore for myself and will be selling off a rarer pair of steps with a drawer on the base. They have some surface scratching and I would prefer to redo them, but I would consider selling as is! Cocktail table full restore in Wheat reproduction stain for client to order.